Improved performance and reduced monitoring database size. This allows you to monitor more resources using the same hardware. 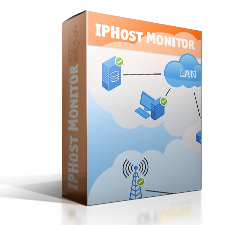 IPHost Network Monitor creates now fast backup of monitoring configuration. You can restore your monitoring configuration only, without monitoring results. Performance optimization: only 1000 latest log records to be displayed in the “Logs” panel when total amount of records exceeds 1000 (remaining records are hidden, but they can be browsed using the link “Show full logs”). Improvement of “Current Problems” tab: the current monitor performance is displayed to the right of the monitor name, or the words “Down” and “Warning” if the monitor does not has current performance. You can read the complete list of new features, enhancements and bug fixes in release notes.